When Donald Trump announced he was running for president. I thought it was a hoax. Now I have to constantly remind myself that it’s real. While he’s quite entertaining, he’s really hurting the Republican party. At some point, the party might have to separate into two. John Kasich seemed to me to be the most reasonable candidate at the first debate, and the one I’d support if I was a Republican. However, Trump won the debate apparently. Well, everyone has their own idea about who won, but right now Trump is leading in the polls. There are 17 candidates and Trump seems to have tapped into a powerful minority. The majority of Republican voters are spread out too thin. I don’t see how Trump could get the nomination, even though it is still a possibility. Supporters often say Trump is not politically correct. It’s had me thinking about being “PC” for the last couple of weeks. I tend to be “PC” without really thinking about it. I admit, I’m concerned about hurting someone’s feelings or offending them. Just because you think the word is fine to say, but it’s important to be mindful of who you’re talking to. I grew up saying things like “retard” and “that’s gay.” I’ve managed to stop saying those things and I certainly don’t miss using them. I understand some people don’t like it; they get used to saying certain words and don’t want to change. Take the word retarded. A couple of years ago, The American Psychological Association replaced mental retardation with “intellectual disability.” In part, this is due to the negative and derogatory meaning the word now has, but it’s also not a fitting way to describe a person’s mental issue. Not every person with a mental disability is a slow thinker, and people can be labeled incorrectly, which in turn can affect a person’s treatment. It’s a much more accurate description. Mental retardation replaced certain words when it was adopted and it is fitting that it be replaced as science advances and we understand how the brain functions. 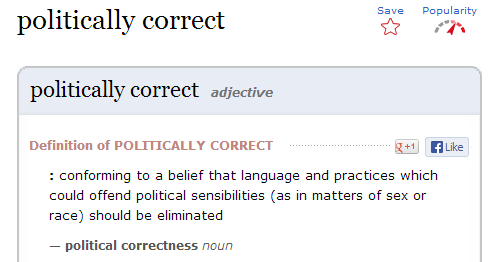 In this example, it’s not simply about being politically correct. There’s a scientific rationale. So does that mean we all need to police ourselves about our language? Well, yes, hopefully you do. Sometimes it’s just best not to say anything at all and you don’t want to get yourself into trouble for saying the wrong thing. However, if you want to say something that isn’t “PC” that’s fine. You have the right to say what you want, you just don’t have the right to control how people respond to you. When some shock-jock get’s fired for saying something racist, his rights are not being violated. The first amendment only protects you from legal action. There are still consequences for what you say. I try to pick words that fit the right context, that convey what I intend to say. I don’t always do it very well, haha, but I try. If that means I don’t want to use a particular word, that’s my right. I can respect you for being unfiltered if you can respect me for being “PC.” It would be wonderful if everyone stopped saying words that I find offensive, but I won’t try to force people to stop. I just may have something to say if you do use a word I don’t like. That’s freedom baby! Trump will continue to say what he wants, and it will eventually catch up with him. I’m confident about that, but who knows. Maybe a year from now we will have a President Trump. Maybe a year from now I will have a million dollars and a movie star wife. And a canoe, for some reason. Take 2 for technical difficulties: The REAL question is, which movie star do you aspire to marry? Next Next post: Where in the World is Scott Brown?